Having clean water in your aquarium isn’t important just for the looks, but it is vital to the health of your fish. If you are looking for the best freshwater aquarium filter but are short on time, then we can help you make an informed decision. We have sifted through countless models to bring you the top 5 products in terms of quality and features. After careful examination, Dr. Fox has chosen the Penn Plax Cascade CPF5 as the best you can find for sale. In the unfortunate event that this model is sold out, then we recommend that you give the next-in-line Penn Plax Cascade 300 Submersible CIF1 a look. Ideal for aquariums with a capacity that ranges between 55 and 100 gallons of water, this model can filter an impressive 300 gallons of water per hour. The Bio-Falls Quad-Filtration makes it quiet, while the activated carbon included traps foreign particles and removes toxins. This model offers a wide range of benefits, but there is an associated cost with replacement filters that you should consider, to make sure that it stays within your budget. With the many features this filter offers, including an adjustable filtration rate, it might be exactly what you are looking for. This fully submersible model can filter up to 70 gallons of water per hour, which means that it works best for smaller aquariums with a capacity ranging from 1.5 to 10 gallons. The suction pumps allow you to mount the filter anywhere you want on the tank, while the internal sponge has beneficial bacteria. For some users, this is not a particularly quiet pump, although it works very well for its purpose. If you know that you want something super quiet, then be aware of these reviews. With an adjustable and directional water flow pump head, this filter offers multiple benefits, so do keep it in mind for your next purchase. 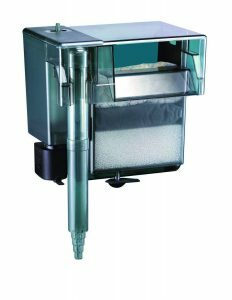 The AquaClear Power Filter A620A1 is a truly powerful filtration system that can pump up to 500 gallons of water each hour and is most suitable for large aquariums with capacities that go as high as 100 gallons. You can adjust and control the water flow by up to 50% without any damages. If you live in an area that deals with power shortages quite often, you should get an additional backup battery to prevent these fluctuations or the filter risks of getting damaged. Given the integrated multi-filter media system that allows you to manage your stack of filters as you need, this model is one to keep in mind. 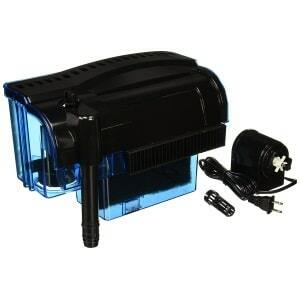 This hang-on filter is ideal for aquariums that can hold between 55 and 100 gallons of water. The Penn Plax Cascade CPF5 can filter a whopping 300 gallons of water per hour, but you won’t notice that thanks to the advanced Bio-Falls Quad-Filtration system that isn’t just effective, but also very quiet. 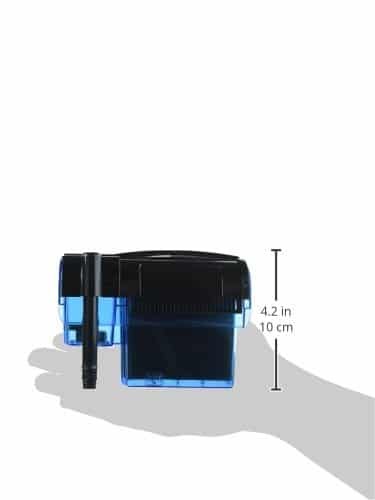 The polyfiber floss cartridge contains activated carbon which will trap foreign particles and remove harmful toxins and other chemicals from water. The advanced Bio-Falls filter traps beneficial bacteria that break down ammonia and nitrites which could otherwise accumulate in the tank and harm the fish. 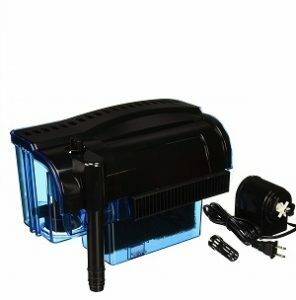 You can adjust the filtration rate anytime by adjusting the flow knob depending on your needs or when feeding the fish. The Penn Plax Cascade CPF5 is easy to attach, just slide it over the edge of a wall, the leveling device will keep the filter in the correct position. 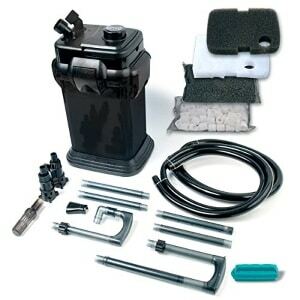 This allows for fast and easy maintenance, making cleaning or replacing filters a breeze. The Penn Plax Cascade 300 is a fully submersible model that can filter up to 70 gallons of water per hour. It is best suited to small aquariums with a capacity between 1.5 and 10 gallons. 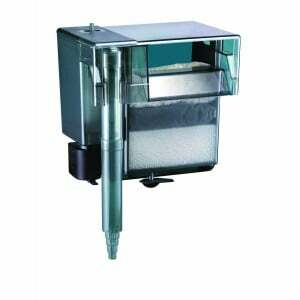 The silent motor will provide for efficient filtering without bothering either you or your fish. You can mount the filter anywhere you want inside the tank thanks to the suction pumps. With the help of the activated carbon cartridge, particulate matter, toxins, and other contaminants are removed, resulting in crystal clear water that is healthy for your fish. The Penn Plax Cascade 300 also features an internal sponge that doesn’t just act as a filter, but it also provides a home to beneficial bacteria that can remove harmful nitrates, ammonia, and other residual substances. 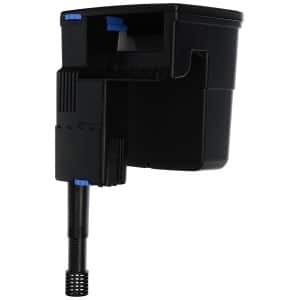 Another feature clients liked is the adjustable water flow and directional water flow pump head where you can also connect flexible tubing or extra accessories. This filtration system is truly powerful, able to pump up to 500 gallons of water per hour, which is suitable for large aquariums of up to 100 gallons. AquaClear 110 Power Filter is not only powerful but also highly versatile, thanks to the ability to adjust and control the water flow by up to 50 percent without affecting either the impeller or any filters. There’s also a re-circulation grid which ensures that the water comes out sparkly clean by passing it through filters multiple times at slower flow rates, increasing contact time and removing even more impurities. The multi-filter media system allows you to stack your own filters and conveniently replace one at a time. The AquaClear 110 Power Filter uses 3 filters: a BioMax filter with ceramic rings, an activated-carbon filter as well as a foam insert filter to provide efficient mechanical, biological and chemical water cleaning. With this model, your fish will surely stay healthy and thrive. 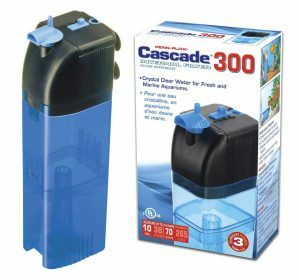 The Penn Plax Cascade Black 1000 Elite filter can handle any aquarium of up to 100 gallons in capacity, with an amazing flow rate of up to 350 gallons per hour. The heavy-duty filtering system comes with 3 types of filters which are easy to install and use – replace any of them and start filtering in just 30 minutes. The 3-stage system makes use of activated carbon, bio-sponges as well as bio-floss filters to ensure that all nasty particles, harmful chemicals, animal and plant residue, and pathogens are removed and that water is clean and safe for your fish. You can see the results in as little as a day of filtering. The Penn Plax Cascade Black 1000 Elite is equipped with control valves to adjust the flow rate as well as hose clamps for easy adjustments. This model comes with a sturdy rubber base to provide stability as well as filtering media, input and output tubes, and filter media. While small, the Seachem Tidal Filter packs quite a punch. Measuring just 8 1⁄16” x 5½” x 7 ¾”, this versatile filter can handle aquariums of up to 55 gallons and has a flow rate of up to 250 gallons per hour. Flow rate can be adjusted according to the volume of the aquarium as well as the preferences of particular fish species. The intake tubing can be adjusted so that water can be taken from any level in the tank. The pump is self-priming while the efficient impeller can clean itself, making this model low-maintenance so that you don’t need to get your hands dirty. When cleaning is really needed, you’ll know, and that’s thanks to the maintenance monitor which will alert you when the time is due. The versatile filter basket allows you to place any sort of interchangeable filter media produced by Seachem, providing you with multiple configurations to suit your needs. We understand that choosing a good aquarium filtration system can be tough, especially with so much information out there, so many types of filters and so little time at your disposal. 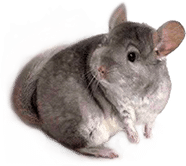 The good news is that we have done all the work for you by studying models, looking at features and reading countless aquarium filter reviews to make sure that we can provide you with a list of top products as well as a comprehensive yet short buying guide to help you choose the best one for your needs. We are glad to do all this work for you so that you get to know just as much as we do about the best freshwater aquarium filtration system without spending countless hours surfing the web. One of the main things you want to check is the flow rate of the filter, which is measured in gallons of water per hour or GPH. 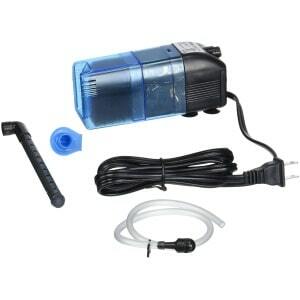 While the best aquarium filter can pump up to 500 GPH, that doesn’t need you necessarily need it. You also need to take the size of your tank into account. If you have a large tank of around 90-100 gallons, then this powerful filter is just fine. But for a 20-gallon aquarium, the flow rate is way too high, filtering 25 times the tank’s entire capacity in just one hour. Depending on the fish species you have, you might also need to take flow rate into account. Some species release a lot of residual matter in the water and that requires constant filtering at high flow rates. Other fish prefer a quieter environment which means lower flow rates. The good thing is that most filter systems come with an adjustable flow rate mechanism, just remember that most of them allow for a maximum of 50 percent reduction in flow rate. Some filters come with single filter cartridges, others have 3-stage systems which use layered filters such as activated carbon, bio foam filters, sponges, etc. For small aquariums or low maintenance fish, simple filters can do a more than decent job. However, you may want your fish to benefit from a clean and healthy environment to live in, and the more filters there are, the better the water quality. Some filters are easy to replace while others require removing the entire filter system. There are also models where you can replace filters one at a time, allowing the beneficial bacteria which handle the breakdown of nitrates and ammonia to stick to the remaining filters so that you don’t have to wait for a few weeks for the colonies to replenish.